Relax, eat cookies and enjoy the holidays! When I spotted a birdcage at the scrap yard some months ago, I didn’t want to show my excitement but I was surely thrilled. Sometimes the business owners put a firm price on certain items but the birdcage was sold for the scrap value at about 1.50$. It’s perfect for seasonal decorations. For Christmas I just put some baubles and other decorative pieces inside and a silver birdie on top. Now we turn to another of my multiple Christmas personalities, lol. I do love the rather girlie birdcage decor above but lately, I developed also a liking for a more rustic and rusty style, as you probably have realized during my last few posts. Last Christmas I had an idea of creating a tree from those round little metal pieces I had used in one of my Christmas tree wall hangings. I thought, when I could find them in different sizes and would attach them to a big rusty screw, that this would make a cool tree. This didn’t work out but I couldn’t let go the idea of a rusty 3-d tree and tried again this year. I looked through our stash of rusty parts from the scrap yard and found several round pieces, including a saw blade, a bicycle crank, large bolts, a spring and a small metal ball. It didn’t take long and my tree was assembled. Then dear hubby welded it together for me because glue wouldn’t have been strong enough to hold every piece in place. Neither very girlie nor rustic is my chippy mirror. It was a roadside find and I had used it without the frame in my studio for a while. Originally the frame was pretty ugly. It was partially tiled and had some wooden appliqués that I didn’t like at all. After those were removed and I had painted the frame a medium gray, it looked so much better already. I exchanged the tile part for a chalkboard. I love how it turned out. My handwriting is not pretty and therefore I transferred the “Jingle Bells” lettering. I printed the words out on regular printer paper. Then I covered the back of the sheets with chalk and traced the letters with a sharp pencil onto the chalkboard. Voilà. Some spots had to be cleaned and some lines had to be completed but it helped a lot to get a nice lettering. Is it really just a few days until Christmas? How could that happen? I’ll try again next year to be ready in time, lol. Are you surprised? I bet you are. Yep, this neutral color loving girl has used a tiny touch of red in her Christmas gift wrapping – and she likes it. If you’re now worried, you don’t have to. This is most likely the only red you get to see here for a long, long time. At least until next Christmas ;). The tags were easy to make. I printed out snowflakes on cardstock. Then I drew a circle on the back and cut around with pinking shears. The snowflake graphics were provided by The Graphics Fairy. Thank you, Karen! For the tiny glittered snowflakes I used a punch and added glass glitter. I recently fell in love with some origami ornaments I had pinned and wanted to try to make at least one. I found tutorials for several kind of such ornaments. I chose one called “twisted kusudama” and got started. Such a flower ball consists of 12 flowers and each flower of 5 petals. That means I had to fold and glue 60 petals. I used vintage book pages and cut them into 1.5” squares. The finished ball is about 2.25” in diameter. After the 12 flowers were glued together, I added some glass glitter for a more Christmassy look. This is not a fast project and needs some patience. The good thing is that the folding is really easy. I’ve made 3 ornaments so far and folded most of the squares while watching TV in the evening. If you’d like to give it a try, you can find the download link to the tutorial here. Have a great start into the week and don’t get too stressed out by the Christmas preparations. Today I’d like to show you some beautiful pallet wood Christmas decorations. The only credit I can give myself for these pieces is, that I kindly asked my dear hubby to make them for me. Hubby started with the small tree above. The design is similar to some I had pinned to my Christmas board. Then he created his own designs and came up with the large tree in the background. The grid was a leftover piece from one of his rusty metal artworks. The last one has some metal too, which is a bit difficult to see though. Each of the higher wood pieces is framed with small rusty coils. Instead of a wooden trunk, this tree got a metal one. After my wonderful little pallet tree forest was finished, hubby surprised me with this beautiful star. I’m so excited about all these fabulous pieces. Thank you so much, sweetie! I LOVE you! If you were wondering about the rusty Christmas balls in the star picture, they are heavy metal petanque (boule) balls. They were a scrap yard find from earlier this year. Aren’t they cool? I’ll be back soon with some more recycled/repurposed Christmas creations. Have a wonderful weekend! Over the last weeks I pinned a lot of trees to my Christmas board, which are made from junk pieces, found objects, scrap wood etc. These pins inspired me to create my own junk tree versions. In my collection of vintage books I found several pretty spines in different sizes that were partly torn or ripped off. I cut them off and glued them onto a background that dear hubby had hammered from pallet wood together for me. Usually I don’t like gold very much but I adore these beautiful embossed spines. For the second wall hanging I adhered vintage book pages to a piece of wood and added a light, uneven coat of gesso. The tree is made from rusty parts of an electric motor and an old hinge. This is my little helper Barney, who finds room in the smallest baskets :-). 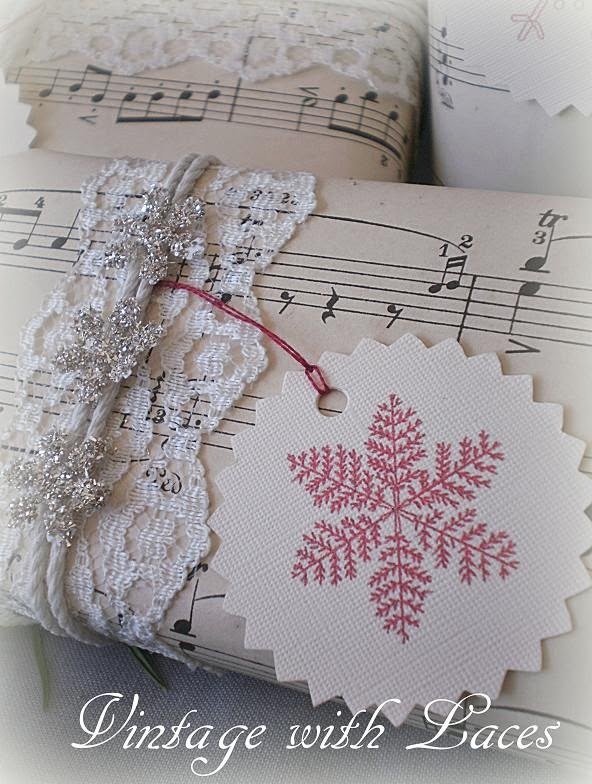 Have a wonderful week and a great time creating and decorating for Christmas. I’ll be back soon with some more recycled trees.